We keep our eyes open, watching for the latest stylus options for the iPad. Actually, it is inevitable that someone in the office will buy a new stylus when it comes out so we get to play with them all. What mades a great stylus? Why should you buy one over another? It all has to do with how you use your iPad. Handwriting folks have a group of styluses that work best for them, while the drawing crowd is split between how they like to hold their pens thus meaning each person has a different ‘perfect’ solution. We will be outlining the particulars for each solution soon since we have found some tips go soft and need replacing, pens can be too light to be comfortable and others seem all wrong but prove to be perfect. Yesterday we got an update from Steve King out of Alameda California about his ‘Hand Stylus‘. Reading the name, the assumption would be that the stylus is some sort of finger thingy. Actually, he is providing a pen style stylus that appears to be physical feature rich. The knurled grip area takes us back to our drafting pencil days. The tips are replaceable by the user so that cuts down on the need to replace the whole pen if the tip goes soft. 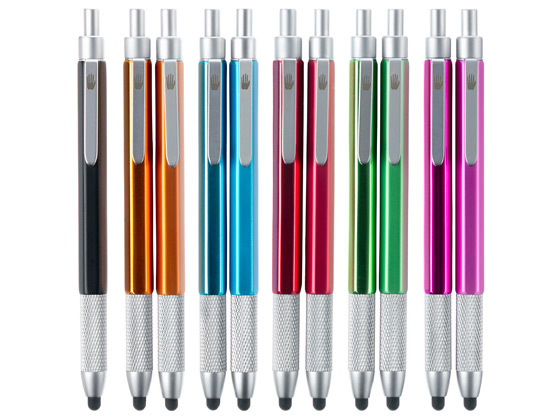 You may notice the clicker end of the stylus pen… yes, the tip is retractable so it is safe to carry in you pocket. Vital statistics: weight with pocket clip = 0.8 ounces; without pocket clip = 0.7 ounces. Length (from extended tip to top of plunger) = 133 mm or 5-3/16 inches. Width = 9.0 mm or 11/32 of an inch. The Hand Stylus is being offered in many colors with a matte or gloss finish. Pictures can tell only part of the story, so we are looking forward to spending a day with these to see if they live up to the requirements of a true daily users. The distribution of the Hand Stylus is currently through a Kickstarter project… while it has 30 days left, it has been successfully funded multiple times over the asking amount. The project shows a July 2012 delivery date. We will try and contain ourselves waiting till then.